Just some terminology before I start discussing this. One octave (Sa Re Ga Ma Pa Dha Ni) is called a Saptak in Hindustani classical music. Interestingly, Octave comes from 8, and Saptak comes from 7. Maybe this has to do with the better understanding and discovery of Zero. Notwithstanding that smart-alec digression, I come back to terminology: The normal saptak that one sings or plays an instrument in, is called the Madhya (middle) saptak. The higher saptak, includes 7 shudha notes above Ni, is called that Taar (high) saptak, and the lower saptak (7 shudha notes below Sa) comprise the Mandra (low) saptak. Another digression: the three saptak system was first introduced by Sharangdeva in the 13th century in his discussion of music of his time in Sangit Ratnakar. Often not enough attention is paid on this critical question. The answer to this question can be fateful to one's learning curve, and one's fluency as an Indian classical singer. So the earlier this question is answered, the better. Here is the 'general' answer: "Sa" should be chosen based on where you can best express the beauty of a given composition. As you can imagine, the discovery of the more specific answer to Gurpreet's question takes a combination of discovery of one's own vocal range, and a discovery of composition. "I don't have Pandit Bhimsen Joshi's range." Right? Discovery of one's vocal range is a simpler task than composition discovery. Still, I think it can have a profound impact on your learning speed. But remember, in Gurbani Sangeet, having a wide range is not as important as hitting the right shrutis. And when you start with your harmonium or piano, you think there is no way you can reach three octaves -- or those high notes that Yma sings. Bhimsen Joshi and Yma Sumac obviously have the ultimate gift from God: a phenomenal vocal range. Right? Wrong! You Likely Have A Very Similar Range. These critic statements originate from two widespread, yet false beliefs. The first belief is that his greatness stems from his range. The second one is that these adept vocalists have an unusually wide vocal range ("it's a God gift"). You can listen to several recordings from Pandit ji on the internet. Let me use a 2-minute mian ki malhar performance by Pandit Bhimsen Joshi as an example: (http://www.youtube.com/watch?v=dL1deOLUK1w). Wah janab, Wah! He uses the second black (D#) as his Sa. Pandit Joshi uses one and a half octaves (total range) in this drut composition. And the taar Ma is not sung with sustenance -- it is sung in passing in fast taans. This is not true of just this composition; most classical compositions range one and a half octave. Longer khayals maybe an exception, but in Gurbani Sangeet we can pretty much ignore those. Its not just Pandit Joshi ji! The one-and-a-half octave unsaid 'rule' is widely adhered to. One-and-a-half range could be mandra saptak Pa or Dha to taar saptak Ga or Ma. The critics just write three octaves to create idols out of musicians; which would be fine if practice was appreciated more than inherent abilities. I use the same one-and-a-half octave rule to decide my normal range. The clarity of notes in taans, meends and murkis is what is striking and makes Pandit Bhimsen Joshi a great vocalist. The second false belief is the range is gift from God. From my experience I believe it takes practice to increase range (and we will talk about that below), and that the patience of practice is the real God-gift, not the range you are born with. But then you ask - what about Yma? She seemed to have and use this amazing range! doesn't she possess a 'special' God gifted vocal chords? No! She is using falsetto in that recording. Yma's true range, especially the one that she started with before practicing, may not have been very different from many of us. Even I can reach 5 octaves with falsettos, but cant really adorn notes with murkis, taans or smooth meends in that timbre; nor have I heard anyone else do it. Falsettos can be used sparingly in indian classical music (that's a whole different topic of discussion). So the good news is that you might have a range comparable to some of the great singers of our time. Now all you have to do is find your range, and develop it. There is very little latitude you have on the high end of your range. The high-end of your vocal range generally does not change beyond your teens. Practice for several years may gain you only a few notes above the highest note you started out with before practice. Think of the high-end of your vocal range as a restriction that God has blessed you with. So try to discover, what it the highest note you can sing both in a sustained way (try a ~5 second alankaar without cracking) and in passing. For example you might be able to sing the high 2nd black (D#) in a sustained way, and the high 3rd black (F#) in passing. Your high-end note will be affected somewhat by the time of the day you choose (I can likely sing half to one notes higher in the evening, than in the morning) and whether you have throat or nasal inflammation (both will constrict your high-end). Your normal 1.5 octave range from your high-end will then start at your highest sustained note Then count 20 half notes -- thats your one-and-a-half octave range. Unlike the high-end of your range, you can significantly expand your lower range with riyaz. The lowest note you can sing in a sustained manner even after just 2 months of correct riyaz can be several notes lower than what you started with before riyaz. "Kharaj ka riyaz" or "Mandra Saptak ka riyaz" is therefore the key to expanding your range as an Indian classical vocalist. I spent a few days doing Mandra saptak ka riyaz with Bhai Gulbagh Singh recently on his last trip to the Fremont Gurudwara (2008). 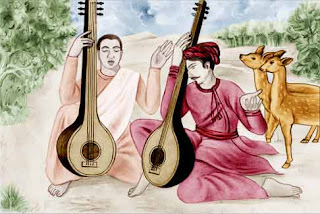 Choosing Sa For riyaz ...One way to practice is to do riyaz completely in the mandra saptak (Sa through Ni) – this is tougher and should not be overdone, because your chords can get damaged (Blood in cough, as I realized when I first started doing this, is a bad sign). The second way, much easier is to practice your compositions 1-3 whole notes below your Sa. I have found it useful to sing most of my practices 1-3 whole notes lower than my normal Sa, and once in a while in my normal range. Try to notice that in the Indian show “Sa Re Ga Ma Pa,” the practice runs are done around 1 whole note below the final runs. Harmonium and Indian Classical Vocal Harmonium is actually quite a disastrous instrument to aid in learning. The excellence of an Indian vocalist often depends on the clarity of pitching and grace notes or slides, in various forms, between the pitches. And for that you need to train yourself to listen to the Sa and its harmonies with other notes while you are singing. That is very difficult when you are playing the harmonium. Moreover, slides cannot be produced on the Harmonium and many harmoniums can have mistuned notes. So I highly recommend practicing with a tanpura or an electric tanpura. You can also have your harmonium just play 'Sa' while you practice. If you are a beginning student of vocal music, you will likely choose compositions from an external source. For more experienced musicians, you may build your composition. Either way, you need to modulate the composition to a note where you can utilize your highest sustained note. So lets say your highest sustained note is the second black on the harmonium. And the composition's highest sustained note is "Sa" from the taar saptak. You can use either first or second black as your "Sa." If, instead, you are singing Asa, and there is a significant use of tar saptak "Ga" in the composition, then you should use the 5th black as your "Sa." (See Example 2 below). Feel free to leave comments, questions and links that maybe useful to others reading this topic. Although this is not true for all singers, I have seen several classical indian females choose the 4th black as their "Sa." Many male indian classical singers use 1st black as their "Sa." So some people call the two scales, male and female scales. There are several 'good' exceptions: Lata Mangeshkar sings at a higher range than most singers and Jagjit Singh sings at a lower range. I myself singer at the lower ranges than most males. I recently was invited to a concert by Mahesh Kali, an indian classical vocalist based in California. I had not heard of him, so I went to his website (http://www.maheshkale.com/). I am very glad I did. For anyone learning classical Indian music, I think he is a very good listen for many reasons. He seems to be a perfectionist, and attempts to stay quite true to the notes. He seems to have spent many long hours practices. This is a very good demonstration to how use your Sa. His performance Sa seems either the first black (C#). For the more classical pieces, that use most of his range, he uses 1st black as his range. For a piece with lesser range, the beauty of higher notes is exploited -- hear his Dadra which is 4-5 notes higher than his Sa. 'Surat Piya Ki' is both a guldasta (various raags used: basant hindol, malkauns, and more) and a partaal (various taals used teen taal, ek taal, and a really beautifully drut jhap taal); really well sung -- a lot of work likely went into this one. My other favorite is his charukeshi based natyageet, He Suranno. Here is a composition that I did last year in Raag Asa. I have sung the chhant in my normal Sa (4th black: G#). I try singing it 1.5 notes above my normal Sa (7th white: B). Plus I sing the same composition in 4th white (F) and 2nd black (D#, one octave lower than from where many sing). To me G# sounds the best because there is the least stretching on the higher notes (taar Ga in this case), and the most comfort with the lower note (mandra Dha in this case). Thx for an elaborate answer; I got the immidiate answer that i was looking for the question i had asked. But i am sure i will be reading your answer again few more times as i continue to learn classical music. please guide me some riyaaz so that i could practice at amritvela...my voice is not good at the lower node of harmonium anr its intermediate at the upper ones. As i'm from pakistan so there isn't anyone to teach kirtan. Dear Mahar Kaur ... Please send me an email at shiv10@yahoo.com and I will help you myself or find you someone in Pakistan. plz let me know how to practice riyaz on harmonium at amritvela??? i have got harmonium but here in Nankana Sahib(Pakistan)i don't find any teacher to teach me keertan.plz someone tell how to do riyaaz for on harmonium??? Hello Shivpreet, I have been using electronic tanpura for some time and i want to try real tanpura. Of course, it becomes a chicken/egg issue since i dont know what to look for in a tanpura. So here are my questions: Are there any advantages with real tanpura or should i continue with electronic one? Are flat tanpura just as good as traditional ones? I usually sing to A#(6.5) on electronic one. So should i get a male/female one? Where should i get one from, i am currently in Chicago, and what to look for in a tanpura? I checked ebay and they are ranging from 200 to 800. Looks like i need to learn about tanpura before i can buy one. I am hoping you can help. Hopefully, you saw my question earlier. Meanwhile, as i am learning Raagas from your website, can i download your songs - simply amazing. Particularly the Baageshri one on Guru Nanak. I have also started listening to Shabad Kirtans - they are so mellifluous and soul stirring. Shivji, I started after a long gap of almost 20 years. I always wanted to be a Dhrupadia, but due to weakness in my voice (and time constraint as I have to spend most of my time in non-musical daily scores) I decided to pursue the light classical genre. My teacher says that if I work a little more on the shrutis and alankars, I can do wonder with thumris and dadras. However, I met a famous voice consultant to get some guidance on how to increase depth in my voice, but whatever he told me was very very depressing for me. His opinion, 'your voice quality does not permit you to sing anything beyond light geet, ghazal or bhajans and you have to accept and be satisfied with that. Better you do not take singing seriously and do not expect any return'. Shivji, what return one would expect from singing, other than making the listeners happy and content by singing'. I was very sad at his words. At this juncture, I came accross your article, and after going through it I am again getting back the confidence which I totally lost after talking to the voice consultant (even you know I stopped my routine early moring mandra-riyaz for 2 days). Thanks a lot, for bringing back the confidence in me. Veer jee, I have a lot of trouble keeping high stamina in my voice, and reaching high notes. I'm currently a teenager (16 1/2), so my voice is changing. This change has quite messed up everything for me. Before this voice change, when I was about 10/11, I would be able to go above the taar sabtaks for really long time, with a lot of stamina. But since this voice change started, my voice hardly reaches the 4th Black key on taar sabtak. Worst is, if I sing too long in the middle sabtak, my voice tires out. And then my voice hardly comes out on lower notes. I can't explain you well, but I really love doing keertan, and reaching high notes, but it just isn't working out. Could you please help me out? I am a beginner, age 22, want to practise riyaz without use of musical instruments. Plz give tips in how to go about it..
Also how long should i stretch individual swars (Sa through Ni)? How much time shud i dedicate to riyaz daily? How many times a day should I do it? I'm looking for recorded riyaz that I can practice with each day. Do you have and recommendations? Hello sir......m learning sufi.....my chord starts from the komal 'ni' of the middle octave......it's my sa nd i use to sing in tar saptak......but my voice is somewhat light i mean when i sing high notes i didn't shout nd my voice becames a little bit thin.....my idol is ustad nusrat fateh ali khan.....plzzz tell me wether m going in a right direction or not doing riyaz in mandra saptak for 2-3 hours is enough for a sufi student......? How to select the perfect sa on the harmonium according to my scale. I don't know how to find my scale. I'm a beginner age 19. I have a 10 year old daughter who can hit all 3 octives! What an amazing blog. Wish I had found this earlier. I have been working on my vocal range using western singing exercises, but this post explains in great depth the theory of Indian classical singing. Much appreciated. Thank you for this valuable sewa.